Biotech stocks are volatile. A single news item can double or even triple a stock’s value overnight. But stocks can also see their values cut in half – or worse – just as quickly. The biotech sector is seen as the Las Vegas of the stock market. It gives investors the chance to win big or lose it all. None of that volatility stops Wealthy Retirement readers from investing in the sector. 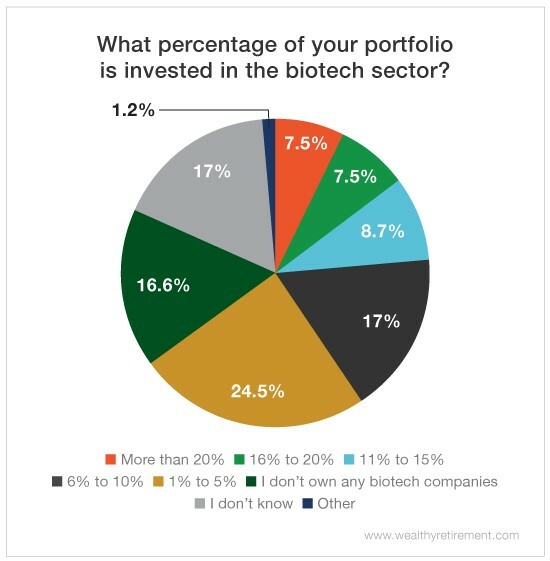 Our survey found that more than 65% of respondents have a portion of their portfolio invested in biotech. You see, investing in biotech isn’t as much of a gamble as many people think. Biotech is actually a great hedge against recessions. The sector performs better than the overall market when the economy hits the skids. During the Great Recession (December 2007 to June 2009), the NYSEArca Biotechnology Index (NYSE: BTK) fell 14%, while the S&P 500 was down 35.46%. This “volatile” biotech index beat the market by 21.46%. The NYSE Arca Biotechnology Index performed even better during the 9/11 recession (March 2001 to November 2001) after the collapse of the dot-com bubble. It rose by 4.2%, while the S&P 500 fell by 7.28%. During the Gulf War recession (July 1990 to March 1991), though, the NYSE Arca Biotechnology Index really took off, rising by 72.47%, while the S&P 500 rose just 5.34%. But even though the NYSE Arca Biotechnology Index outperforms the broader market during recessions, investing in individual biotech stocks (where the big money is made) isn’t easy. If it were, then everybody I know would be a biotech billionaire. You have to choose the right companies. Biotechnology companies burn hundreds of millions of dollars developing a new drug. Many of these drugs have a low chance of success: Just 13.8% of all drug development programs eventually lead to approval. Choosing the wrong company can cost you. A failed drug trial or denial of regulatory approval can tank a biotech company’s stock price. You can easily lose your entire investment if data disappoints or if a decision goes the wrong way. For many, biotech is one of the scariest sectors in the stock market, but there’s a lot of money to be made if you know what you’re doing and can avoid the traps. Successful biotech investing requires a lot of hard work. The double-digit, triple-digit or even higher gains aren’t the result of dumb luck. Most investors need the help of an experienced biotech expert. The Oxford Club’s Chief Income Strategist and biotechnology expert Marc Lichtenfeld has been profiting off biotech stocks for more than 20 years. And with Marc’s guidance, his subscribers have pocketed gains as high as 2,381%. Sure, biotech is riskier than other sectors, but it also offers investors the chance to make the biggest returns in the market. That’s why biotech stocks belong in a well-diversified retirement portfolio. Although the sector is volatile, there are several profitable biopharmaceutical companies, such as Gilead Sciences (Nasdaq: GILD), Amgen (Nasdaq: AMGN), Novartis (NYSE: NVS) and Biogen (Nasdaq: BIIB), that should appeal to even the most conservative investors.